Vachette Pathology is a Pathology Practice Management Firm, we are not a billing agency; what we do is manage your financial bloodline.� We will push your billing process to optimum performance, renegotiate your manage care contracts, and help with the business of pathology, all to ensure your financial future.� For further information, please contact Mick Raich at: mraich@vachettepathology.com or call at 866-407-0763. 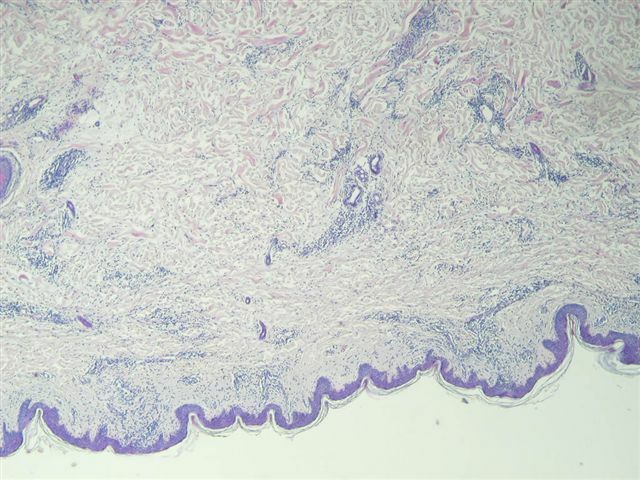 A 64 year old woman had pruritic, erythematous plaques on her abdomen and back that appeared and disappeared randomly.� She also had a long history of smoking.� The clinical concerns were mycosis fungoides or morphea (localized scleroderma).� An ellipse of skin on the abdominal wall was excised. Micro description: The skin biopsy shows epidermis, dermis and subcutis.� The epidermis shows focal acanthosis, parakeratosis and spongiosis.� There are no blisters or intraepithelial microabscesses, and exocytosis (inflammatory cells in the epidermis) is minimal.� The dermis shows a patchy and perivascular infiltrate which consists of small, round, mature appearing lymphocytes, as well as some histiocytes and eosinophils. 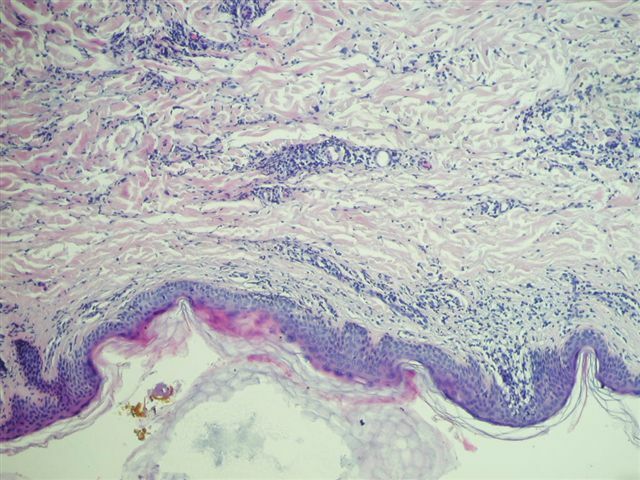 This case illustrates a problematic area for many pathologists - interpreting an inflammatory dermatosis.� In these cases, input from the dermatologist is crucial in providing the correct diagnosis. 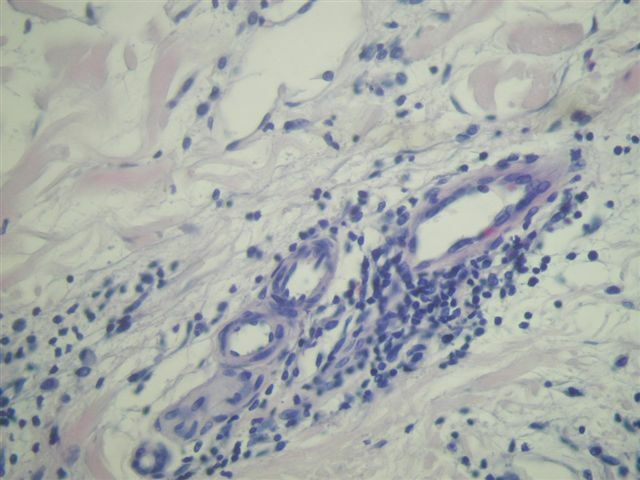 The histology is non-specific, with mild acanthosis and spongiosis and focal parakeratosis.� The dermis shows a superficial perivascular infiltrate of lymphocytes and histiocytes, with variable eosinophils and melanophages. There may be exocytosis of neutrophils and eosinophils. 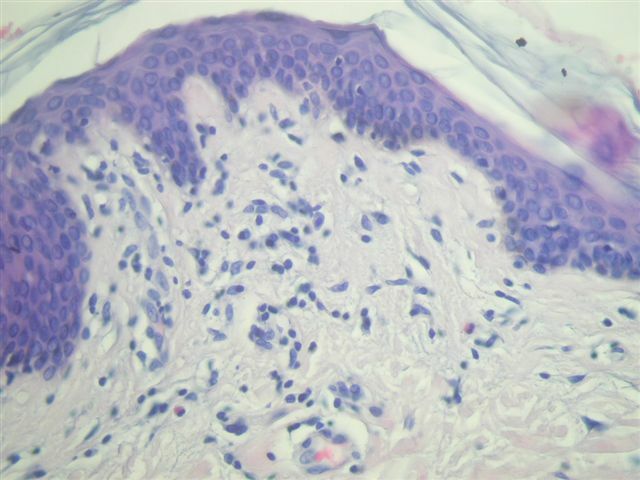 The cause of erythema gyratum repens is unknown, but may have an immunological basis due to the occasional presence of C3, C4, and IgG at the basement membrane zone with direct immunofluorescence.� It may also be considered a paraneoplastic syndrome.� Treatment of the underlying malignancy may cause remission.